There is a meaning to this story that transcends its original context and applies to every challenge of life. Hanuman symbolises devotion, sacrifice and determination. These qualities are absolutely necessary to accomplish any difficult and strenuous task. If we are weak in every other way, devotion, sacrifice and determination can still carry us to success in seemingly impossible tasks. Whereas if we possess every other skill and talent, it is not good enough if we are lacking in the qualities that Hanuman symbolises. 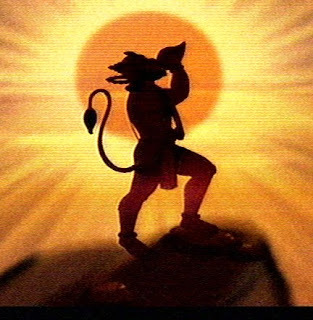 If we are lacking in every other way, we’ll be OK with Hanuman alone, but if Hanuman is missing then we’re in trouble. This is true on many different levels of activity. From a military perspective it has been shown that a weaker force with single-pointed devotion and thirst for sacrifice towards their cause is more effective than a larger, better equipped force that is lacking in belief and dedication. On an inner spiritual level, the qualities of Hanuman are essential for the spiritual seeker to be able to make a true realisation of the Divine. Even a simple man with dedication, devotion and determination can attain God, whereas a highly educated person with strong intellect and many other qualities would still fail without the qualities of Hanuman. These are the true values you speak of that we are no longer taught in the education system. This great wisdom is something we should never forget, or try to bring back in our lifes. I’m thankfull to you, this website, for this explanation about Hanumanji. And also for all the other wisdom-information on this website!